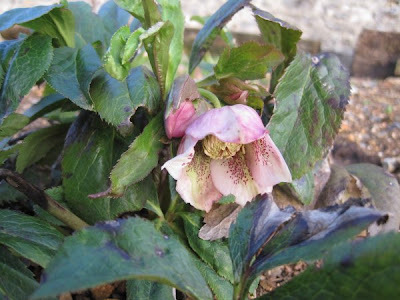 One of the self-seeded Christmas Rose plants that my Mum gave me from her garden last year is flowering. Cool. Yay! The plumber has connected up the hot water to the pipes under the floor, and it's all working! Not too much heat at the moment, because the concrete's not dry yet, but the floor is at a steady 15 degrees, and is warming the place gently. Lovely. This is the installation. The warm water comes into the big red mixing chamber via the thick red pipes coming up from the floor, and via the left-hand pump. The pump to the right of the chamber takes the warm water and circulates it through the pipes under the floor, via the distributor on the far left, mixing it on the way with some of the cooler water returning from the floor so the whole thing doesn't get too hot. The electrics and electronics that manage it all are in the two smaller boxes attached to the wall. 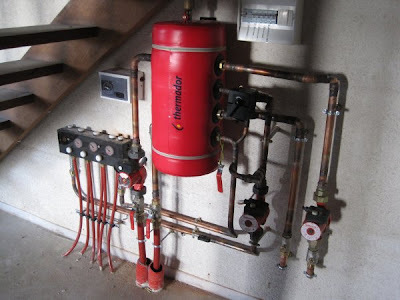 The two pipes on the right, and the right-hand pump that all lead nowhere, are there ready for radiators to be installed in the rest of the house, later. Soon I will enclose the whole lot in a little cupboard, but right now I'm just pleased it's all in and working. Well, back in the throbbing metropolis of St Pierre sur Erve (pop. about 150 depending on who's on holiday), everything seems to be running as normal. 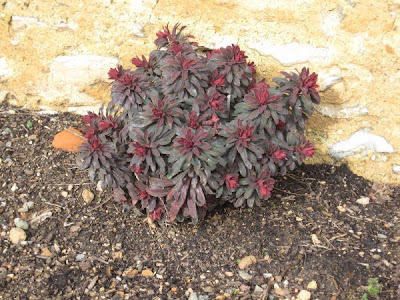 The Euphorbias I bought last year seem to have survived the Winter, and are presenting a lovely splash of colour, deep red, unusual at this time of year. 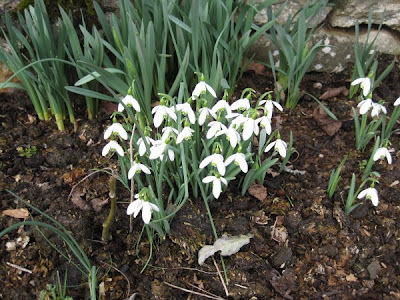 The snowdrops are out. Lots of them about at the moment, but they're still pretty. 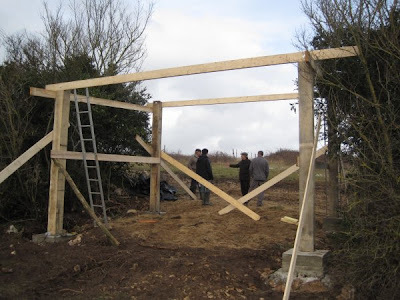 There is a shelter being built for the Aurochs, just down the road. Opportunity for a conflab. 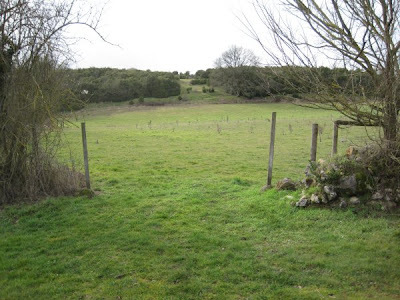 But the big gossip is that someone has knicked the gate to the Aurochs' Summer field. (French for to nick: piquer) Here it is... gone! The last skiing day it clouded over, and started to snow. 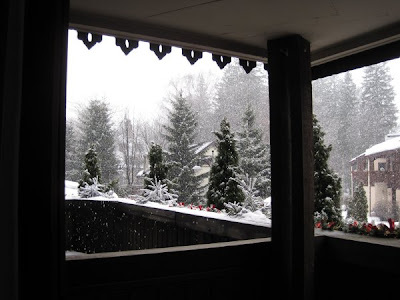 A pretty send-off, then, and some nice new snow for the people coming on holiday next week, after us. The snow was falling at the hotel when we set off, and the cloud completely blocked out the view of the valley when we got to the ski slopes. The following morning, the train picked us up only 5 minutes late, but that's a bit worrying since the first connection was ten minutes. 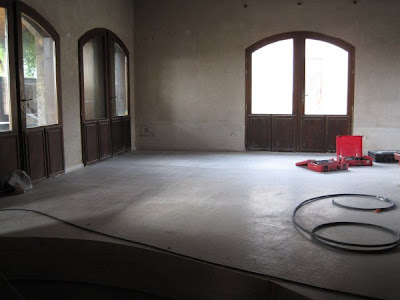 When we arrive home after an uneventful journey, we find that the concrete floor has at last been poured, as belatedly planned. Yay! On the way back, during the change of trains at Lyon, I wandered into the Virgin shop. They were selling new CDs for 10 euros each which I thought was pretty good, but then I saw they were two for 15 euros. (Say, 13 quid) I bought Lilly Allen and Shakira. Can't be bad. The weather was forecast to close in a bit later on in the week, so we chose to visit the Auigille di Midi while there was still only a little cloud about. 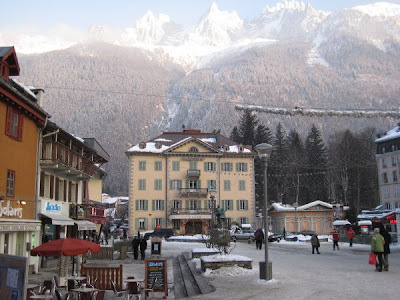 The Aiguille du Midi is one of the peaks of the mountain range around Chamonix. You access it via two cable cars and a lift, and you find yourself at 3842 meters high, or just over 12,000 feet. In an aeroplane you'd start needing oxygen at about this height. It was high, and very cold, but the views were spectacular. 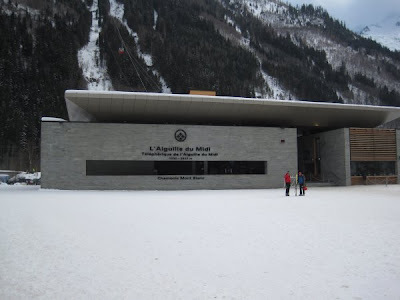 The cable car building in Chamonix is a fine piece of architecture, modern in style. 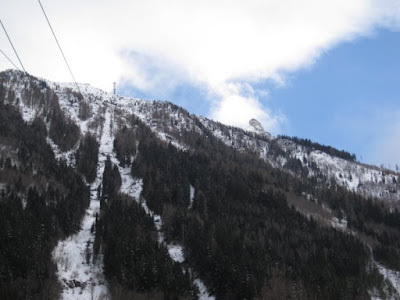 The Aiguille is the peak you can just about see silhouetted against the little cloud -it's a long way up! 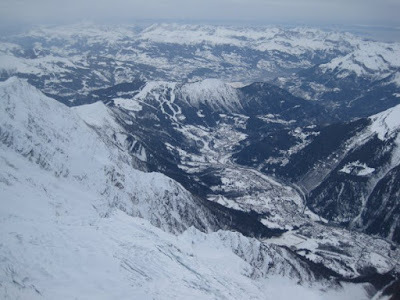 The view down into the town is really impressive: those things that look like little hills in the middle distance are the mountains I was skiing on yesterday. But it was cold up there: -20, and windy. I took my gloves off to take some photos, and in 5 minutes my little finger had frozen. I could still move it, but I couldn't feel it. Weird. It seems to have recovered though. 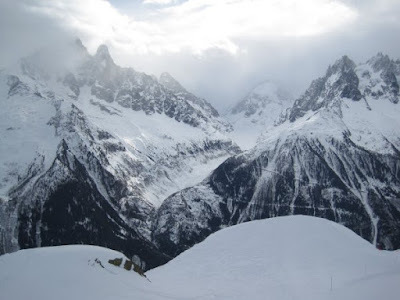 The Mer de Glace (Sea of Ice) is a glacier near Chamonix that you can visit. In Summer, the frozen surface is undulating, and topped with lines of frost and snow, so it looks like waves, hence the name. 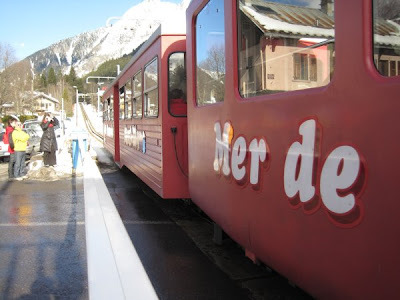 You access it via a rack railway that takes you to a station up in the mountains. 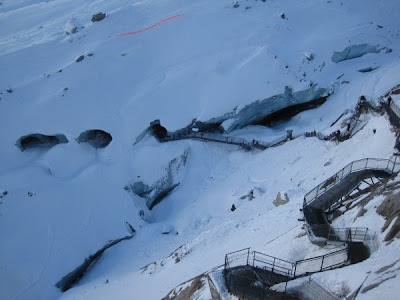 When it was built, the glacier was about at that level, but nowadays, having taken the train up, you then have to take a new cable-car down, and then some 300 more steps down to reach the ice. The glacier is a lot smaller than it used to be. 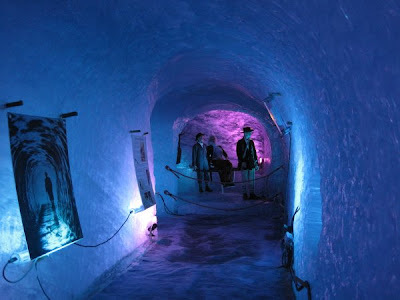 Every tourist season, caves are carved out into the ice, and you can see there a small exhibition showing the discovery and early exploration of the glacier. 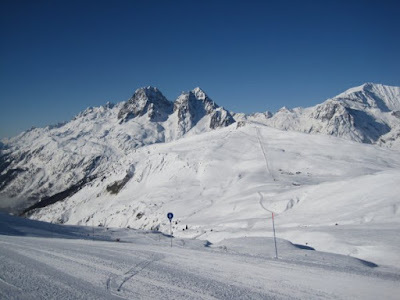 If you're mad, you can ski down it too, access and departure being managed by helicopter. 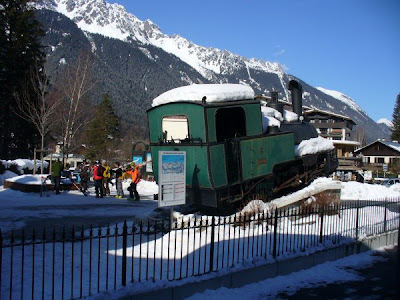 The old train that took you up was this steam-powered one, burning 400 kilos of coal for each trip. The new one is comfortable, but less quaint. 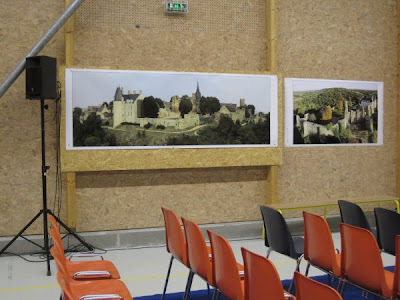 These are the holes carved in the ice, and a small view of the exhibition. 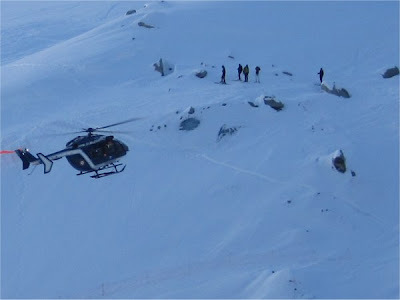 A helicopter collects skiers from the glacier surface. And a view of the glacier from the other side of the valley. You can see the V-shaped glacier valley between the two mountains. 150 years ago the glacier came up to the level of the black line of rocks; these days you can barely see it. The railway line is the higher of the two tracks you can see on the mountain to the right. Some good friends invited us to go skiing with them, so we went. 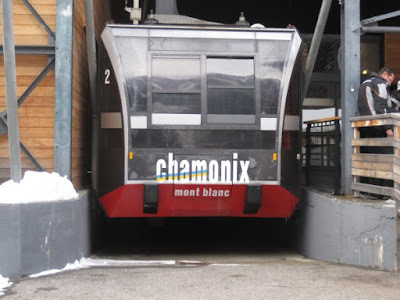 The wife did most of the organising in fact, and as a result we had a great time in Chamonix. 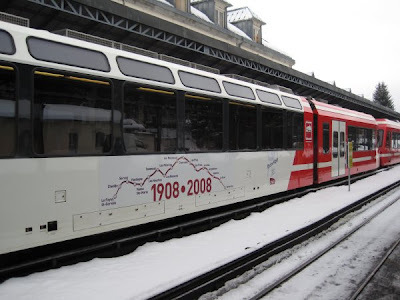 The French railway company SNCF lay on some special trains for the skiing season so we took the train direct from Le Mans that connected to a short commuter train ride from the resort. Our TGV turned out to be a Train of Great Slowness and we arrived an hour and a quarter late for a half-hour connection. 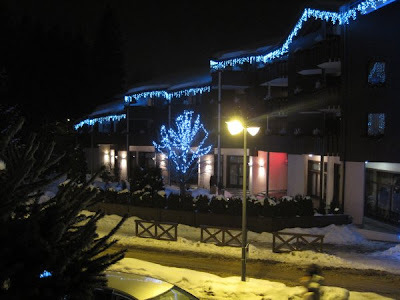 But we got there anyway, settled in to the hotel, and sussed out the ski hire for the next day. Our wonderful instructor Annette. Her real name is Anne but she is tiny, and the suffix -ette in French means little. 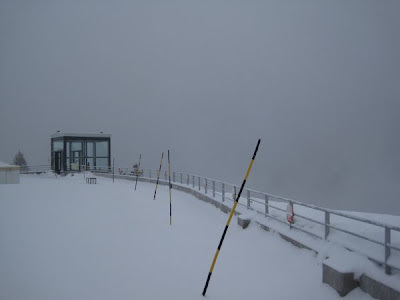 And the first view of the ski slopes... 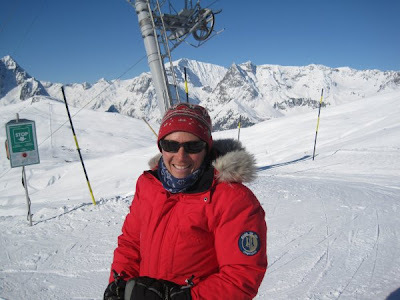 It's been a long time since I skied so I hope it all comes flooding back. 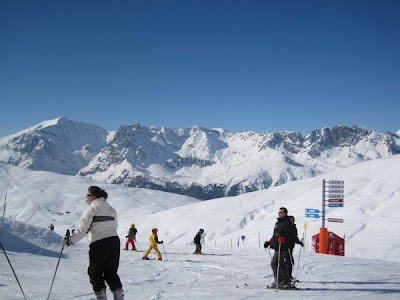 Skiing is an activity, but it's also an atmosphere, a feeling. 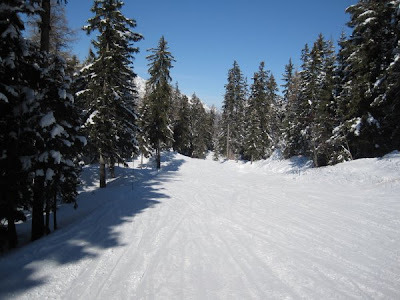 The quiet of the slopes, the rush of speed, the feeling of stillness when you stop, the cold, fresh air. And the views, of course. They look innocent, don't they? So why is it that they choose to go wrong at critical times? 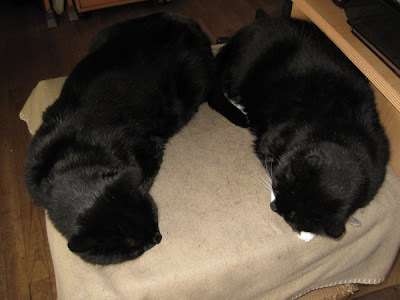 A couple of days ago, Minuit (the one on the left) came in with a hurt shoulder, first thing in the morning. You couldn't touch any part of his leg or side without him yowling or hissing. Not like him at all. Off to the vet. "Yowl Yowl Yowl Hissssss" "I'm trying to find out where it hurts" says the vet "......hmmm everywhere... and he's in shock". Verdict: a big blow to the left side - a car? a cow? An X-ray shows no breakage. "Make sure he can still pee and crap OK", says the vet, so he's given some anti-inflammatories and sent to stay at the cattery, where he can be kept under scrutiny. He goes out all the time so observing bowel movements any other way is just impossible. So on Wednesday morning he goes to the cattery. Wednesday... nothing. Thursday.... nothing. What is it with cats? Thursday evening phone call to the vet. "You had an appointment for Friday afternoon, but bring him in in the morning, just in case." Friday morning... result at last. Huge result in fact. The wretch. At the vets? Pronounced fine, but a septic bite wound found on the left front leg. A fox then. A narrow squeak, one life used up, 6 to go I think. Looks like snow on the way. 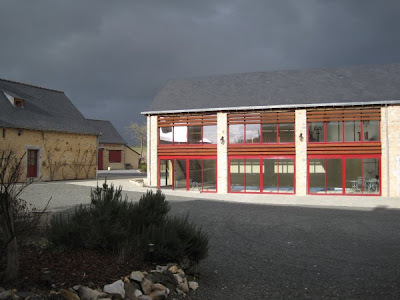 There is what is probably best described as a tea room that opened last year in St Suzanne. 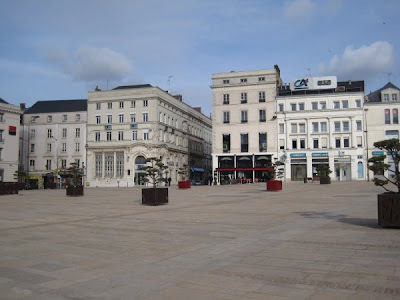 It's run by English people and they offer a fine place to come and eat or drink, enjoy the life of the town square, and the sunshine - at least in Summer. It's called "Maîtres de Pain", Bread Masters if you like. I had always thought it a bit of a strange name for a tea room. It turns out that Maîtres de Pain is the name of a TV series that ran in the early 90s, that was filmed in and around St Suzanne. It was very popular at the time, and featured some well-known French TV stars. 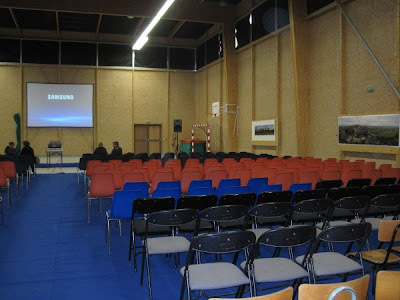 On Saturday, the entire TV series was shown in the town's socio-cultural hall (community centre? ), free for anyone who wanted to turn up. 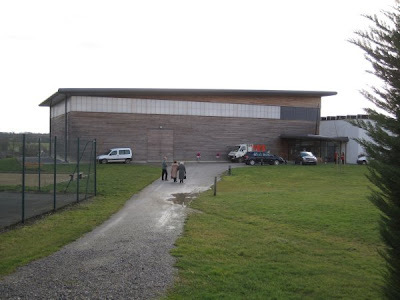 The hall itself is basically a big hangar, its concrete floor marked out for various sports, and it is also used for concerts, ceremonies, plays, archery, etc; anything you might need a big hall for. It seemed that the whole town was there. The showing started at 4PM and ran on with just a break for dinner (barbecued sausages, wine, and crusty French stick sandwiches were available for purchase) and carried on until 10:30. The TV series was excellent. Set in the 1930s and early 40s, it included all sorts of local landmarks, and it was pleasing to see one of the Harmonie's ancient horn players and his house featured too. Being French, it didn't feature a plot as I understand a plot to be. Some people were introduced, some things happened, and then it stopped. Good, though. A real intermission this time. 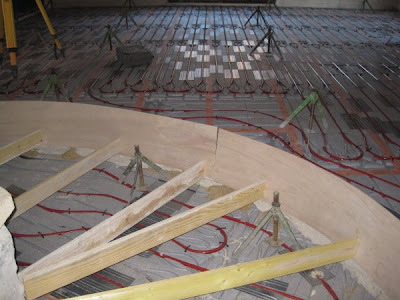 The mason and his team came to pour the concrete floor and discovered that there is not enough depth in the centre of the room, so they refused to pour it. Quite right. I don't want my floor and tiles cracking up in a year's time. So the plumber is coming back to lift the tubes and insulation and chisel out a greater depth of floor. Meanwhile of course the place is still a tip, and still freezing. Good job the weather has been mild. A few days ago I bought a saw blade for pruning or trimming trees. It's from the Wolf Tools range, so you attach it to the handle of your choice, depending on how far away (read: high up) the branch is that you want to saw. 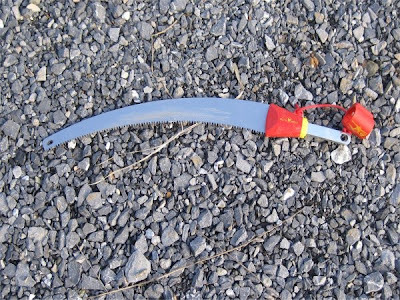 It has a curved blade, something I had taken for granted in tree-sawing blades before, but it has a subtlety of operation that I had not appreciated. 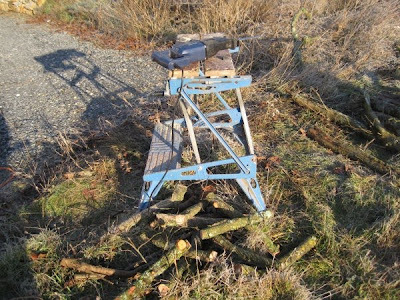 When you use it with a long handle to saw high-up branches, when you pull it towards you the curve in the saw causes it to catch on the branch at the end of its travel. As a result it doesn't slide off the branch and start falling towards the ground, so you don't have to keep repositioning it. There is a type of wild plum that the French call Mirabelles. The fruit is yellow, plum-shaped and small, about the size of the end joint of your thumb. If you pick them and eat them later, they taste like very sweet plums but if you eat them straight from the tree they have a special honey-like flavour. I have a few Mirabelle trees in my garden. 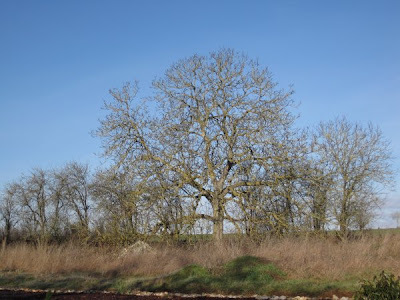 Some are old and need a bit of pruning, some are crowding a fine walnut tree and need to be cut down. There are also a few self-seeded saplings around that I need to tend and nurture. Sunday dawned cold but clear, and as the temperature rose it was clearly going to be a fine day for working outside, as long as you were wrapped up warm. The wife and I went out to cut up some of the trees I had already chopped. 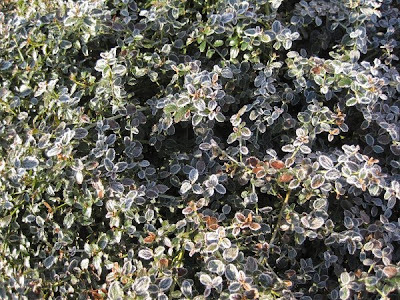 The frost on the Ceanothus is melting as the sun starts warming one side, while we start cutting the wood. This walnut is crowded by the Mirabelles, so I will take out the ones to the right of it, and those to the left that are touching it. 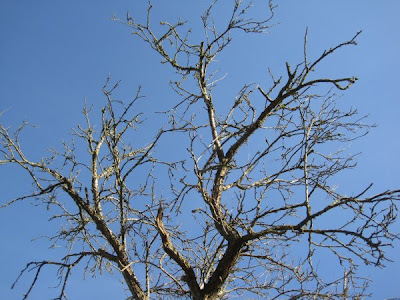 The trimmed Mirabelle shows its branches against the clear sky. 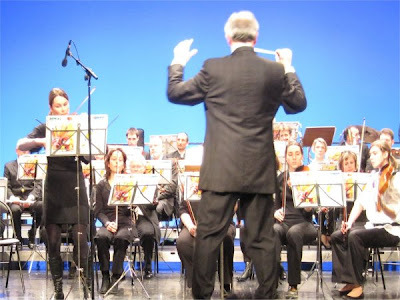 In the late afternoon there is a free concert of amateur musicians in Le Mans, the first half presented by an orchestra, the second by a wind band. It starts at 4PM so it's an ideal opportunity to go and have a curry lunch, a leisurely coffee in the café on the square (shown here), before queuing for a seat. The concert hall is full, and rightly so: the orchestra is excellent given its amateur status, and the wind band were close to pro. Excellent.